There are certain moments in one’s life when you know you are where you belong. Times when you feel you have found the thing you were supposed to do and a calmness and serenity settles. I have felt this way twice in my life. The first time was when I created my family with my husband. I knew I was fulfilling a destiny to be a wife and mother to my three children. 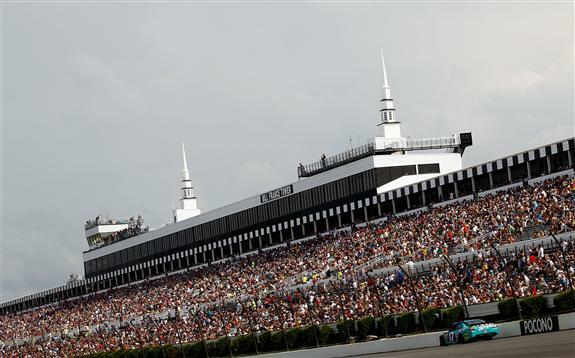 The second happened last weekend at Pocono Raceway. As I had reported I was sent to cover the action at Pocono Raceway by MotorsportsUnplugged.com. I did that and felt I truly wrote one of my best pieces from the track. Fortunately, my experiences are mine to share with you now. My time at Pocono Raceway was split between duties of the media – my first time in the role – and spending time with friends who work at the track who wanted me to experience Pocono Raceway from their perspective. These friends were so excited to have the opportunity to show off their track they are so proud. My time at Pocono began with a lovely dinner hosted by Brandon Igdalsky, track president, and his mom Louie, daughter of Doc Mattioli. It was a “Media Picnic” held at Victory Tower with tables and chairs, wine and mint juleps, and a very tasty buffet with all kinds of delicious foods. I was allowed to bring a guest so my husband and I dressed, found seats, ate, and met some lovely folks – a couple from the UK who had known the Mattiolis for over 30 years, and a television journalist from the local affiliate who had been covering races at Pocono for 30 years or more. Our conversations were lively, spirited, and left me glad to have met such interesting folk. Saturday was most exciting. For the first time I heard the Camping World Truck Series trucks roar to life and race while exploring the grandstands – especially the high ticket areas – with my guide. I saw the area where spotters stand, I saw the glass enclosed skyboxes, and felt my chest nearly explode as the trucks thundered their way around the track in front of me. Later, while preparing another article in the media center – a room filled with stations to plug in your computer to enable a work environment for us media types to crank our stories out from the track – the third, second, and first place winners of the truck race were presented to us to ask our questions. I saw Ty Dillon and Nelson Piquet Jr. At first I was a bit shy and unsure of myself, but after I lost my opportunity to ask a question of Dillon, I quickly raised my hand to question Piquet Jr. To my surprise and delight, I was called on and went into action. Instead of feeling nervous I was pumped up! Being an on-air personality on several radio programs, I am most comfortable interviewing guests. This was the same thing only this time I got to make eye contact! We had to wait for race winner Joey Coulter to come to the media center because he was still enjoying post-race activities as the champion. We were told Coulter and his crew chief would be along shortly. Then the door opened and… in walked Richard Childress, team owner for Coulter. I’ve been told we are not supposed to be star struck as members of the NASCAR media and, for the most part I am certainly not. But, being a longtime Dale Earnhardt fan I have a respect and idol-worship thing for Childress. I didn’t do anything untoward but my breathing got shallow and I felt like raising my voice to ask, “Do you know who you are?! You are Richard Childress!” But good thinking prevailed and I kept quiet. Coulter and crew chief Harold Holly arrived, the press conference unfolded and I asked more questions. It was a grand first experience. I stuck around for ARCA interviews after that race as well. I was very relaxed and comfortable in that role as media. Sunday dawned iffy weather-wise. But I showed up bright and early to get a ride in the pace car with Brett Bodine. Unfortunately he couldn’t make it so John who works for NASCAR did the honors. That was a fun albeit too short ride around Pocono at about 70 mph. I never did find the Tweetup that I was so excited to be a part. Sometimes I just wasn’t at the right place at the right time, but I worried not. My adventures lay elsewhere. My Pocono friends struck again and whisked me away near start time of the race to the very top of Victory Tower. I saw the drivers enter, some, like Jeff Gordon, with their entire families, and get ready for driver introductions. From that point, after introductions concluded I saw and heard presentation of colors, the singing of the National Anthem, and was directed to salute the gorgeous majestic American Flag that presides over the grounds at Pocono. The flyover was so close I felt I could touch it. That with the combination of the crowd cheering reduced me to tears. The enormity, the pure scope of experiences I had at Pocono Raceway was overwhelming and so special. Finally, I had the grand opportunity to sit in the media center when the rain-shortened race winners were presented to us. Martin Truex Jr. and Kasey Kahne, third and second respectively, were terrific interviews – they both answered my questions about Watkins Glen. Jeff Gordon, race winner and a favorite of mine since he burst onto the Cup scene over two decades ago, was even better than I thought he’d be. Gracious, genuine, kind, and a fabulous responder to my questions (yes, I asked more than one), I was tickled by his responses. He is truly a very happy family man and is thrilled by his latest victory. My time at Pocono Raceway this year will go down as a crowning achievement in my career. I have no idea what the future will hold, I just continue to plug away at my work. But I do know that having had the experiences I did at Pocono Raceway as a member of the NASCAR media are yet more reasons why I love NASCAR.